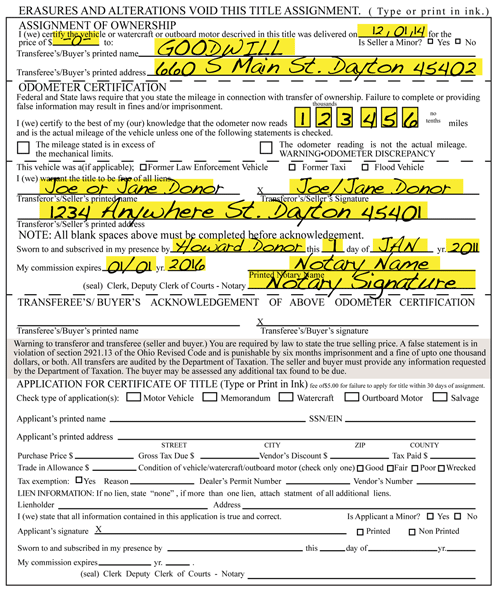 The yellow highlighted spaces represent pieces of information that must be completed on the Notarized title when donating your vehicle to the Goodwill Auto Auction, a service of Goodwill Easter Seals Miami Valley. Please check with your banking institution or credit union that you have an account with as some institutions will notarize your signature(s) at no cost to you. Please Note: If the vehicle possesses two owners on the title, both owners must sign the title. In addition, the title can possess no other marks or "White Out". Please contact 937-228-2886937-228-2886 if you have any questions.